Would you ever consider drinking tea in order to stop male pattern baldness? Well you night after reading this article. Sound crazy? Well here’s how it works in a nutshell. DHT (dihydrotestosterone) is an androgen hormone that is largely responsible for what we know as male pattern baldness. It’s a derivative of testosterone and, if possible, you want to stop that testosterone from being synthesized into DHT in order to prevent balding. That’s where the connection between green tea and DHT comes in. Green tea is thought to help stimulate testosterone and prevent it from being converted into DHT. This may sound far fetched to you, but I’ll explain a bit about why the medical community believes it works. Green Tea and DHT: Why Green Tea vs. Other Kinds? Green tea contains compounds known as polyphenols and flavonoids. Flavonoids gives green tea some of its health benefits as an antioxidant and anti carcinogen. Something else unique to green tea is its abundance of carotenoids (Vitamin A), tocopherols (Vitamin E), ascorbic acid (Vitamin C), Zinc, and Selenium. These properties are all known to prevent hair loss, and even promote the regrowth of hair. 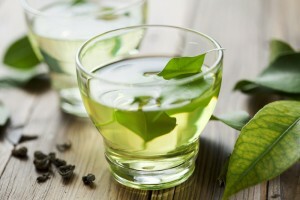 Green tea is like having a number of hair loss remedies mixed together in a tasty, warm beverage. Green tea has a host of other health benefits beyond preventing hair loss, but since this article is about the link between green tea and DHT I’m going to focus exclusively on hair loss prevention. Green Tea and DHT: How Does it Work? As with most natural health products on the market, the evidence supporting the link between DHT and preventing hair loss is largely anecdotal. However, it has become so strongly linked to baldness prevention that many hair loss products on the market now include green tea in them. Anti inflammatory and antioxidant: Inflammation is the root cause of many chronic degenerative diseases and can contribute to hair loss. Oxidation accelerates inflammation. Green tea has a lot of polyphenols. Polyphenols are also potent antioxidants, more potent than either vitamin C or E. They help protect against heart disease, cancer, rheumatoid arthritis and Alzheimer’s as well as hair loss. Natural remedy: Green tea is completely natural, and should definitely come with no side effects. Though it does have caffeine, so be mindful of how your body responds to that. Otherwise, drinking green tea won’t subject you to side effects you may experience from prescription hair loss treatments. Regrowth: Green tea is said to be able to regrow hair, as well as prevent it from falling out. Hair also tends to grow in thicker and healthier when green tea is part of your daily routine. For that reason, those who aren’t concerned about balding may want to drink green tea just to have thicker, healthier, and shiner hair. An antioxidant called EGCG is responsible for stimulating hair growth as a result of drinking green tea. The only way to get the full benefits of green tea is to consume it daily. Having a cup here and there will not be enough to see a noticeable difference. If you’re truly concerned about hair loss and believe a more serious solution might be needed, please contact me to see what options are available to you. You may need a more potent extract and investigation of the underlying cause.